So yesterday, Phil went to pick up the boys at school as usual, and when he arrived, he found Andrew crying. Andrew's teacher, Miss Melanie, was trying to console him, but she wasn't sure what had happened. Then John-Paul spoke up for his sad little brother and explained that Andrew had wanted to go to the snack bar to buy a snack. But when he tried to pay the lady with his coin, the lady told him that he wasn't able to buy a snack with a chocolate coin!! Poor kid, he had found the candy treat in his bag and thought he could buy something with it! So innocent and sweet...at least he was able to eat a special snack after all, a chocolate coin! I went into labor 9 days after I was maid-of-honor in Maura's wedding. I was about 5 days early and as big as a house. We didn't know if it was going to be a boy or girl, but were hoping for a boy because we wanted John-Paul to have a brother. Since I had been induced with John-Paul, this was my first "real labor" and it was really slow. My contractions started at 5 am on October 3, 2004 and were on and off all day. By 9 pm that night, I went to the hospital to get checked by my midwife, and found out I was only 3 cm dilated. She said I could either go home or stay the night in the hospital. I was nervous about going home and having to go back to the hospital in the middle of the night, so we decided to stay. I walked around the hospital for a couple hours, and did countless laps around the maternity wing before I decided to try the stairs to speed things along. Well, little did we know that we weren't allowed to leave the maternity wing, and we got in trouble when we came back from walking the stairs!! However, it was worth it, because my water had broken (only a trickle) and the real heavy labor had begun. I was trying to go naturally (drug-free) with this labor, but the pain was so intense, and I finally started begging for an epidural. Phil asked the nurse to check my dilation, but she didn't because they had already called for the anaesthesiologist to come. When he got there and gave me the epidural, the midwife finally checked me and said that I was 9 to 10 centimeters! I wish that I had known that before I got the epidural, as I would have tried to go without. But alas, I was able to rest for a while, and then 2 pushes later, Andrew was out! Andrew was 8 lbs. 4 oz. 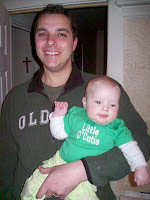 and looked huge compared to John-Paul's birth weight of 6 lbs. 5 oz. He also looked completely different than our fair John-Paul, as he had dark hair and skin. He was an absolutely adorable baby. I called him our Asian baby, because the shape of his eyes made him look Asian...so cute! We gave him the middle name Pauric because while I was pregnant with him, my Uncle Pauric had died in Ireland. He was a wonderful, holy man whom we all loved. 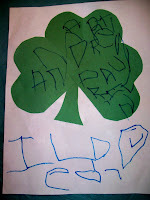 After naming Andrew, we found out that my Uncle had always signed his name "Pauric" but it was really "Padraig", the Irish form of Patrick. Whoops! 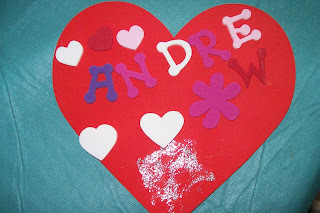 Now Andrew has a funny story to tell about his name in the future! Andrew was a difficult baby as he had colic, but I cut dairy out of my diet for the first 4 months of breastfeeding, and he successfully breastfed until 11 months old! He never once took a bottle or a pacifier, he only wanted me or his thumb. He was a very energetic baby, and started walking at 9 months!!! He wasn't speaking well at 1 years old (he always said "Daditch" for everything), and we found out he needed tubes in his ears because they were filled with fluid and he hadn't been properly hearing us, which is why he wasn't talking. After the surgery at 19 months old, he started talking like crazy! At Mass on Easter Sunday after the Eucharist, a children's choir sings the meditation song from a choir loft up high in the back of the Church. Andrew's eyes grew wide and he turned to me and says "Mom, the angels are singing because Jesus is rose (risen) and it's Happy Easter!" Before leaving to go to my brother's house for Easter dinner, we told the boys to go to the bathroom since it would be a long drive. They emerged a minute later, and I said "Did you both go potty?" John-Paul said "Yup, we went at the same time and we made a cross with our pee!" 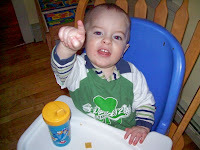 And finally, every time we mention the names of Jesus or Mary, Eamon blows a kiss into the air! I was thinking about Jesus' suffering that is about to take place tomorrow on Good Friday, and it reminded me of my labors. Now, don't get me wrong, I am not comparing giving birth to a child to being crucified, I am only saying that His suffering on the Cross reminded me of my suffering in labor. So I thought I would start a four-part series on my labor/delivery stories, mostly just so I could get them written down to make my kids read whenever they are being naughty...the old "Do you see what you have put me through? Now go clean your room!" Just kidding, sort of. All during my pregnancy with John-Paul (after the first 3 months of morning sickness) I had what I thought was severe heartburn. I would get these attacks where it would hurt in my chest and radiate to my back, keep me awake at night, and take my breath away. It was so bad, I swore giving birth must be less painful than these attacks. It would be so horrible sometimes that I would vomit from the pain. However, every time I went to the doctor I would downplay how bad it was because I didn't want to be a whiny first-time mother who couldn't stand the "normal" heartburn pain. My doctor put me on prescription heartburn medication, but it didn't work, and I just kept living with the pain. Then when I was about 34 weeks pregnant, the pain was so bad one night that I couldn't eat, drink or sleep, and so I went to the hospital and they ran a bunch of blood tests on me. The nurse actually took Phil aside to tell him that she thought I was having panic attacks, and it was all in my head. Then the test results came back and I had an ultrasound and we found out I had gallstones! So they told me to go home and not to eat any foods with fat in them, and they would have to remove my gallbladder after I gave birth. They put me on pitocin and after 12 hours I wasn't progressing very much so they took me off to let me sleep and my uterus rest. The following morning, which was my 24th birthday, they started the IV again, and I began to progress by the afternoon. I was trying to give birth naturally, but the pain was so intense from both the gallstones and the pitocin-induced contractions that I was begging for the epidural. Once I got it, I felt awesome and took a nap for 2 hours. 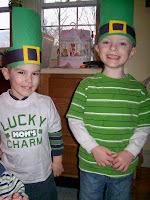 When I woke up around 7 pm, they checked me and John-Paul's head was crowning! I pushed 2 times and he came right out! The midwife actually just told me to laugh instead of push and then when his head and shoulders were out I reached down and pulled him out and onto my chest, it was so cool! John-Paul's breathing was a little shallow so they took him to the nursery for the night and gave me a pump so I could start expressing milk, which was a horrible introduction to breastfeeding for a first-time mom. But, I did the best I could that night and in the morning they took me away for surgery. I remember crying before they took me away because I was so scared something was going to happen (it was my first surgery) and I had just met our first-born son and was already away from him for too long. But the surgery went smoothly, the doctor actually said my gallbladder was really enlarged and what was supposed to be a tiny incision to remove it ended up being about 1.5 inches. They gave me pain medication to take but because I was breastfeeding, I only took one pill. So just when we thought the worst part was over, and I was discharged the next day, they told us John-Paul's bilirubin level had spiked and he needed to be under the lights in the nursery for a few days. Since I was discharged, we had to stay in the Ronald McDonald House across the street and get shuttled back and forth all day and night in order for me to breastfeed him. We finally got the green light to take John-Paul home after three days under the lights, and even though it was about 11 pm, we booked it out of there and drove 1.5 hours to my Mom's house. We were so glad to be out of the hospital! 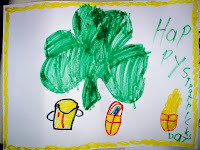 This is a picture John-Paul made at school that says "Happy St. Patrick's Day"
Me: John-Paul, where's the cross necklace you got from school? John-Paul: I'm wearing it under my shirt. Me: Why don't you wear it over your shirt so everyone can see it? John-Paul: Because I want to keep Jesus close to my heart. Complaning, saying "I can't wait to turn 18"
He tells her "It's a nice place"She says "It'll do for now"
I've got 2 babies of my own.One's 36, one's 23. 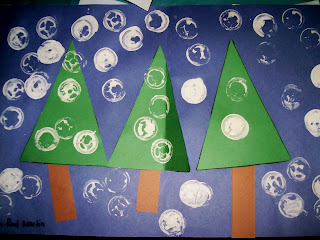 Every Tuesday, the boys' school sends home a bunch of their art projects from the previous weeks. As much as I love to see their masterpieces, all these papers definitely clutter up our house. So, I had a bright idea (if I do say so myself) to take pictures of their artwork and then I could have them to look at digitally forever without all the mess and clutter. 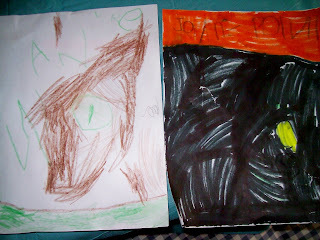 Here are some of their most recent works: the first one is their birdhouses side by side, the second one is Andrew's valentine heart, and the third is John-Paul's snowy winter scene. 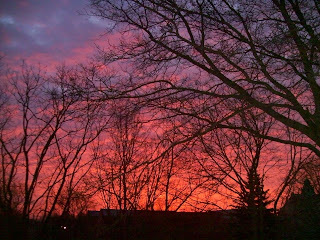 This was the view out the window one morning when the baby woke up extra early. What a great sunrise! 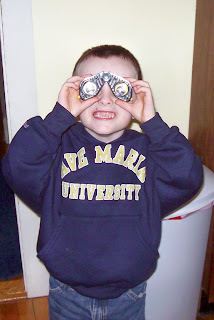 John-Paul plays with the binoculars he got when he turned 5! 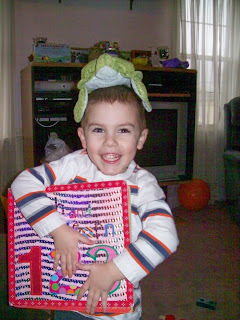 Andrew poses with his class pet, Timmy the Turtle! 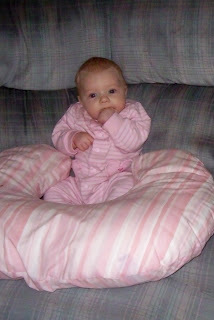 Maggie sitting back, relaxin, and of course, teething at 3 months old! 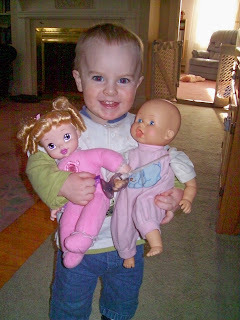 Eamon playing with dolls. He loves them even though we refuse to buy him any, so he just steals his cousin's and sister's dolls! This was the question that our pastor, Fr. Landry, asked during a homily a few years ago. He told the story of how his mother used to always do so much work for the Church and his father grew to resent it. A wise priest said to his father, "Are you mad that your wife loves Jesus MORE than she loves you?" And he then realized that his wife was doing the right thing...loving Jesus first and foremost. What a great story, and one that I really took to heart as at the time because I was struggling with Phil being gone on Sunday mornings leading the CCD program. I had to be at home by myself with two young boys and pregnant with the third, and feeling quite resentful (and hormonal!) about the whole thing. That homily made me realize that Phil wasn't choosing to leave me alone, pregnant, with the kids for a few hours on Sunday mornings, he was instead choosing to show his love for Jesus and the Church. So, I then chose to show my love for Jesus by accepting my role in the whole thing and growing to enjoy my alone time with the kids. Now the 4 kiddos and I have great Sunday morning traditions where we get donuts and watch a movie together. Thank you Jesus for opening my heart! 1) As I am pumping milk for the baby, John-Paul asks "Why are your nickels going in and out like that?" 2) I am wearing a wrist splint recently because I pulled a tendon. When I went into the shower I took it off and put it on the bathroom counter. Andrew came in and said "Mom, why did you take your wrist off?" 3) As I was plucking my eyebrows this morning, John-Paul (who recently had a splinter removed with tweezers) said, "Wow, you have a lot of splinters in there". 4) While watching my neice, Lilly, we were singing a song and Eamon wasn't interested in singing with us. So Lilly looks at him and says "He's not singing, he needs batteries!" 5) At Mass, every time we walk up to receive Jesus in the Eucharist, Eamon starts pointing and shouting "Cracker, Cracker"!